The students in Mrs. Christiansens second grade class have enjoyed reading Janell Cannons Stellaluna, comparing bats and birds, researching bats, and writing, writing, writing!! We wrote summaries, short plays, research reports, a letter to Stellaluna, and four kinds of poems. We focused our research on the little brown bat. Some of our resources indicated this bat has been known to live for thirty-two years, a fact that intrigued the students! We would like to thank Mrs. Kintner for helping us create bat collages in art class, Mrs. Carroll for teaching us a bat song in music class, Mrs. Hall for helping us scan pictures, and Mrs. Silverman of Clinton School for inviting us to be part of this wonderful project. We hope you enjoy the artwork and writing selections posted on our web page. All bats are mammals. They fly at night. They are nocturnal animals. Bats are the only mammals that can fly. Bats do not get into peoples hair. Little brown bat has big ears and uses echolocation to find insects. They help people by eating insects. It can live to be 32 years old! Another name for little brown bat is house bat. All bats are nocturnal animals. Bats use their claws to hang upside-down. They are mammals because their babies are born live. No bats live in Antarctica because it is too cold. 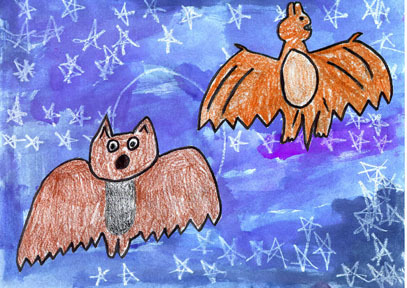 Bats use echolocation to find food. Little brown bat babies are called pups. Their wingspan is 9-11 inches. When a bat has big ears it eats insects, and this bat does eat insects! All bats are nocturnal animals. They hang upside-down by their claws. Every bat flies and they are the only mammal that can fly. Little brown bats can live to be 32 years old. They look ugly and fierce, but are nice. 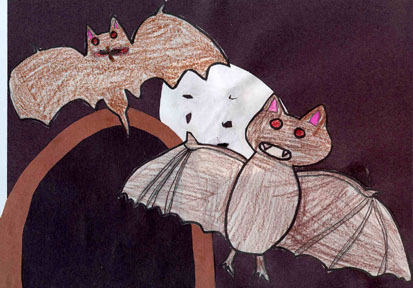 All little brown bats eat insects. You can also call the little brown bat an evening bat. But a bird has feathers. But a bird lives in a nest. But a bird has thick wings. They are helpful to people by eating bugs and insects. They help people by eating insects.